Sam Tordoff kicked off his 2018 Dunlop MSA British Touring Car Championship season in style with a top four performance in the Team GardX Racing with Motorbase Focus RS during the first official test session of the year at Donington Park. The Leeds-based driver made his return to the BTCC grid at the Leicestershire circuit, with the unveiling of his new Motorbase-run Ford Focus RS charge for the 2018 campaign to the media during the morning’s proceedings before the afternoon test session was opened up to the public. 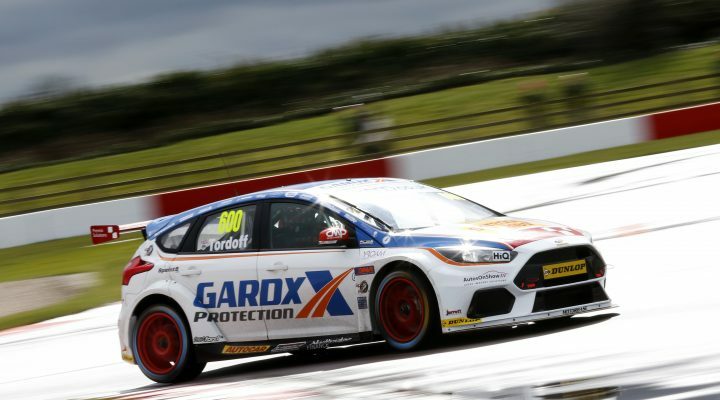 In spite of the wet and damp weather conditions, Tordoff set a promising early pace in the GardX-backed Focus RS and quickly got back up to speed in the front-wheel drive machine, setting the fourth fastest time of the day. “I’m really pleased with how the day went,” said Tordoff. “We didn’t expect to do anything special during the test, we just worked through our plan and went through the programme we had in mind and ended up in P4, which is a solid start and gives us plenty to build on. “At this time of the season, we just need to try stuff and see what it does so that when we get into a race situation and we need to throw something at the car, we know what effect that has. It’s just about building up as much data as possible. “It’s exciting to be back in the BTCC. I got a great reception and a lot of people made a point of welcoming me back, so it was great to jump straight back into it and be competitive. I’ve got a great core of people around me in the team with a lot of experience, and it feels like home already which can only be a good thing.